I have said it before and I’ll say it again, I have had pizza in just about every state in the country. 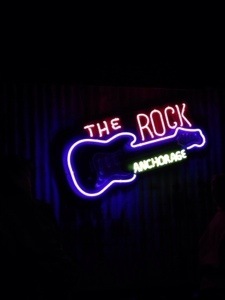 Tonight we headed over to The Rock, a new pizza place in Anchorage, Alaska. As soon as we walked up we noticed the the cool brick and iron work and the fire! We walked in the restaurant, once a Red Robin burger joint, and was assaulted (pleasantly, I might add) to a barrage of rock-n-roll, album covers, and black lights. We were seated quickly and our waitress came over to take our drink order. My wife, Michele, ordered a beer and we ordered an appetizer. The place is awesome! It is decorated in cool rock related gear and the booth seats are covered in song titles. The menu items all have a rock-n-roll theme. We ordered a 16″ pizza, the Founders Favorite–a red sauce pie with pepperoni, sausage, mozzarella and ricotta cheese. We added mushrooms too. Our appetizer arrived shortly before the pizza. We ordered the brown sugar mozzarella bread. It comes with a side of ranch and pizza sauce for dipping. “This stuff is addicting!” Michele said. She’s right it was amazing. It is just the right amount of sweet and cheesy and the tangy kick of the Ranch was an awesome complement. Our pizza was delivered on a large cookie sheet and our server dished us each up a slice. Michele is picky about her pizza and she liked it. I love all pizza and this rivals any pies in Alaska including Moose’s Tooth and Mountain High Pizza. Even the rest rooms are decorated in cool concert stickers, black fixtures and industrial steampunkt style. By the time we left the place was filling up quickly. On our way out I glanced into the bar. They have a cool fire pit table in the middle of the room. Next time we will sit in there and order a sandwich and a rocktail ! Our bill was reasonable. 44 bucks and I left a ten buck tip just because of what the waitress said when Michele commented on the food. “Isn’t everything amazing? I will be 400 pounds when I quit here,”‘ said our server. Hell yeah, we will be back! Anchorage Alaska’s restaurant scene is getting better and better.